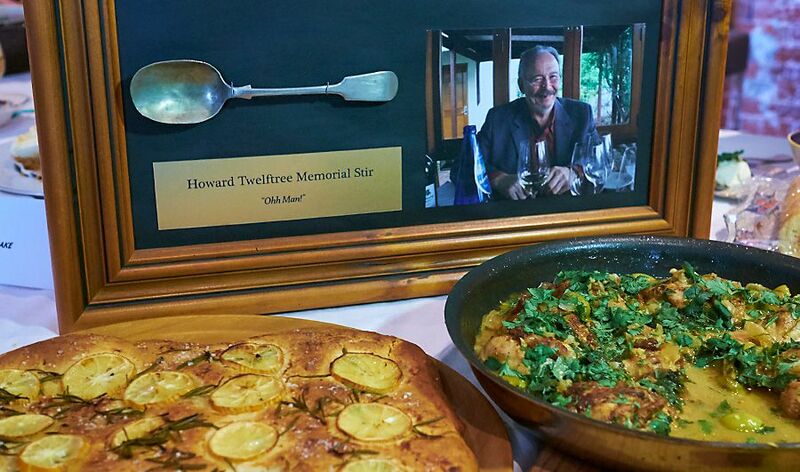 That’s why our seasonal South West City community cooking competition is called the Howard Twelftree Memorial Stir. The perpetual trophy is a silver stirrer. 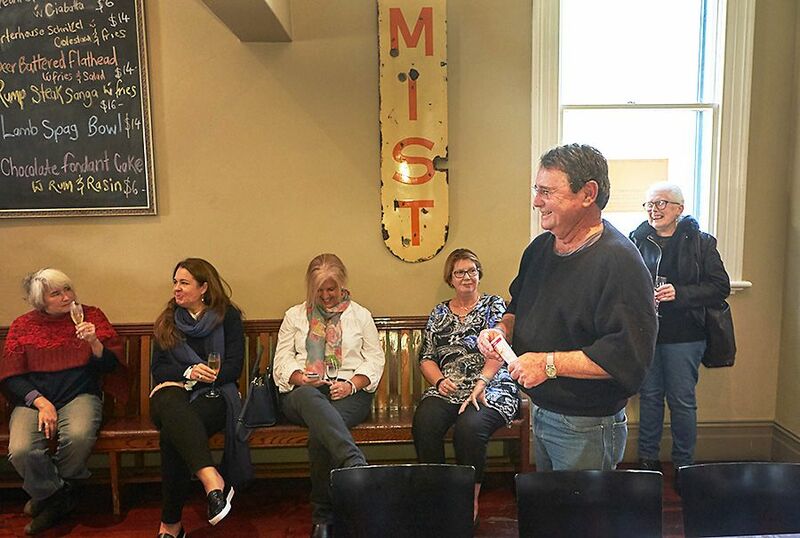 The first seven seasonal cook-offs at our local Duke of Brunswick Hotel went off without a stir – just the occasional neighbourly squabble over ingredients and some repressed recipe rivalry. So we were due for a food fight, and finally on Sunday we got one. 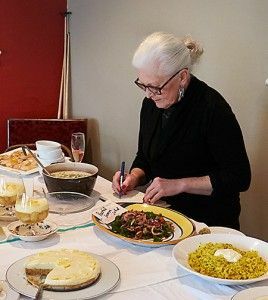 Our invited judge Ann Oliver is one of Australia’s most respected food persons. As a marker, Ann is hard but fair. Derek before the judge’s decision. 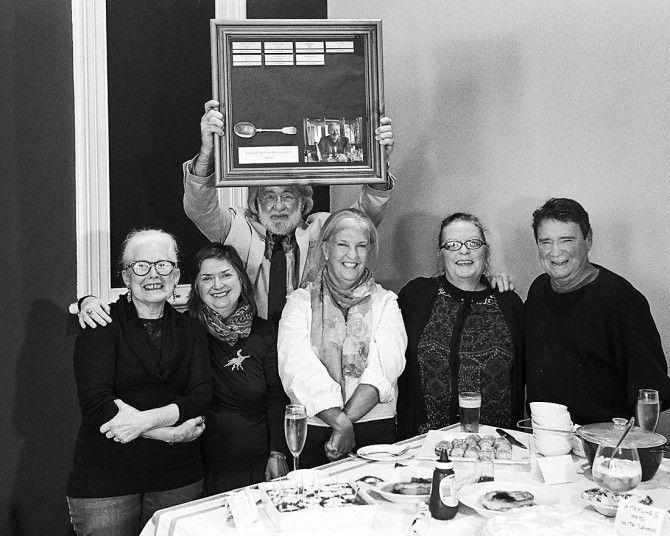 Our own Derek ‘Fluffy’ Robertson is a triple winner of the cook-off, a local hero, an assiduous amateur chef, a sensitive soul. Fluffy decided it was time to poke some gentle fun at the prize he has almost made his own. The seasonal ingredient was lemon, so he designed a lemon pie floater. 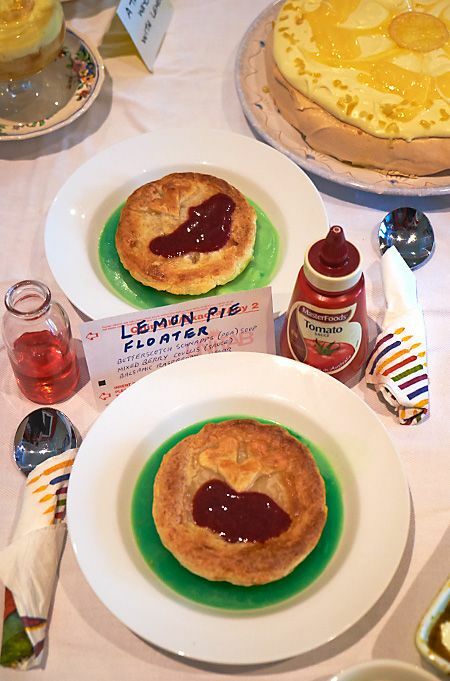 The ‘pie’ was pure cooked and vitamised lemon, no sugar or colouring, in pastry.The ‘green pea soup’ was butterscotch schnapps and finely grated green lemon peel. The ‘tomato soup’ was a coulis of mixed berries. Brilliantly concocted, it looked like something you’d feed to a Martian straight off the flying saucer, and much scarier than the real thing. One mouthful of Fluffy’s Floater and Marvin would be back on his way to Mars. In her summing up of all the contestants, Ann described the Fluffy Floater as ‘ingenious but disgusting.’ Phew! Our own poor dear Fluffster! 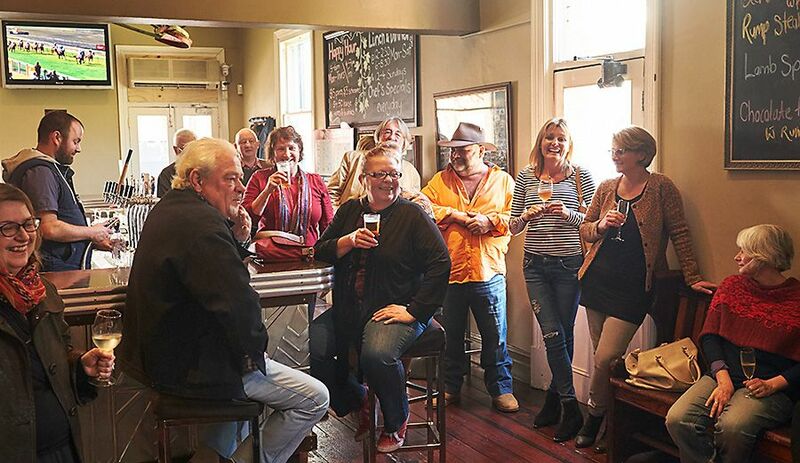 Then again, when a phrase enters the local lingo, you know a community-building event like ours is hitting the spot. 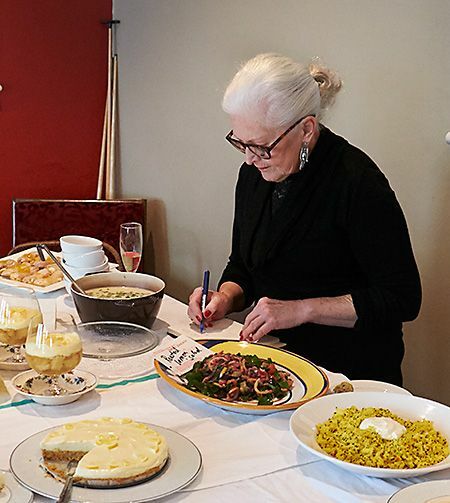 Ann took the judging very seriously. Even the Salvo bloke who collects on Fridays is ‘ingenious but disgusting,’ although he doesn’t know it. To create something so ‘ingenious but disgusting’ that the dish itself and the person who made it will never be forgotten, would seem to me to be what cooking is all about. Maybe though, that’s why I judge the consolation Packing Case Prize, not the real shebang. Meanwhile, as this stark human drama played out, Liz Ho and Michael Jacobs got Ann’s nod for their tagine-style chicken with green olives and preserved lemons in the savoury section. 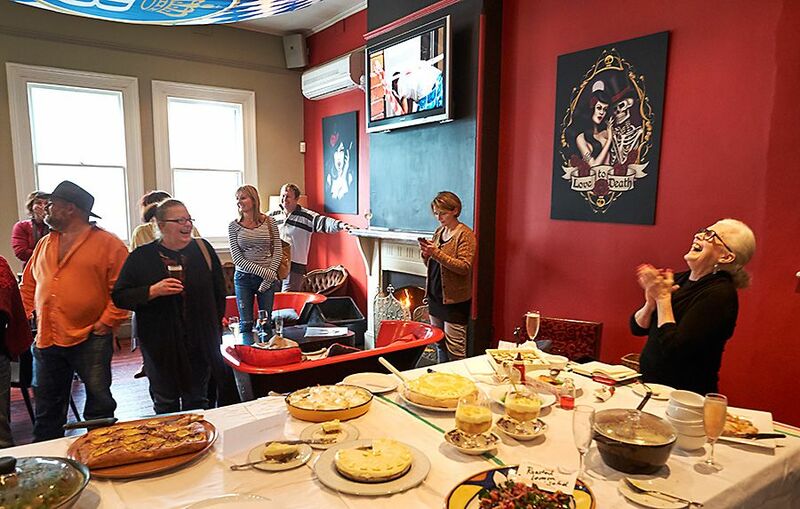 Dianne Stubbings was triumphant in the sweets with her lemon curd tart. Libby Martin, with lemon focaccia, is the Packing Case queen. *See their recipes below. Then it’s on to the next seasonal cook-off, at the Duke on July 26. Ann Oliver is thinking of entering. All his friends who gathered around him this week will do their best to make sure Fluffy does. 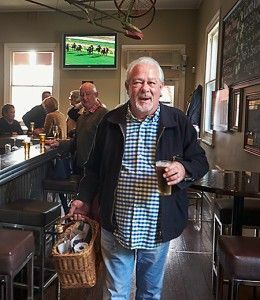 It will be good for him to get back on the horse. Parsnips at 10 paces anyone? I reckon Howard would have loved it. Libby and Ann obviously found something funny ! Derek contemplates his future as the front bar crowd listens intently to the announcement. The winners : Libby’s Lemon Focaccia and Elizabeth and Michael’s Tagine-style chicken with green olives and preserved lemon. 500g bread flour (00) or strong plain flour sifted. Toss lemons in 2 tbs olive oil set aside. Place yeast sugar and half salt in bowl. Add 250ml warm water and set aside until foaming. Place flour yeast mixture and 140 ml olive oil into bowl and mix together with hands till it comes together, continue to knead until smooth and elastic (about 10 mins) You can do in mixer with dough hook but by hand is great therapy.Place dough in lightly greased bowl, cover and leave to rise about 45 mins. Shape dough into a 22cm x 35cm rectangle and place on a lightly oiled oven tray. Use your fingertips press dough all over to form dimples. Brush dough with olive oil top with lemon slices, rosemary, and sea salt. Cover with plastic wrap and let rise for a futher 45 mins Bake in 200C OVEN FOR ABOUT 30mins tap with fingers should sound hollow inside. Thats it simple as just takes a bit of time. This dish celebrates good old ‘’Maryland with skin on and bone in ‘’. We were pretty chuffed that Judge Ann Oliver drew attention to the use of red chicken meat in the dish. Her tolerance of flavourless stringy white chicken breast has run out. We agree to the hilt. We often make this dish in the cold months, and serve it with rice or couscous. We reckon that teaming it with Libby’s stunning lemon focaccia is worth a try next time! Overnight marinating is best, but at least 2 hours. 1 hour or so to cook. 4 Chicken Marylands. We usually get entire pieces – in effect, the leg quarter, not just the drumstick and thigh – which gives us some offcuts to make a small stock for the dish. Cut through leg joint to separate thigh and drumstick pieces, then remove the pelvis and tailbone section from the top of the thigh. Do not remove skin or bones from Marylands as these impart flavour. 1 cup – light chicken stock. We make it as described here, but that’s not compulsory. Combine all the spices in a large shallow bowl. Pat dry the 8 chicken pieces, put them in the bowl and coat with the spice mixture. Cover and leave overnight in the fridge, or for at least 2 hours. Remove the chilled, spiced chicken from the fridge and allow to stand for 20- 30 minutes before cooking. At the time of spicing the chicken, use the thigh offcuts to make a simple stock with 1 ½ cups of water. Bring to the boil, add a slice of ginger and one spring onion or chopped brown onion. Simmer for an hour or so and strain. Cool, place in fridge and remove fat layer before using. If you know how to use a tagine this recipe can be adapted, but most people will find that a skillet with a tight fitting cover creates a perfectly good result. A glass cover is handy because you can see how things are progressing, but is not vital. Heat the oil in the skillet on medium high heat. Sprinkle the chicken pieces very lightly with salt (the olives and preserved lemons are also salty) and place skin side down for 5 minutes, until lightly browned. Be careful not to burn the spice coating at this stage and cut back the frying time to avoid this if necessary. Lower the heat to medium-low, add the garlic and onions over the chicken. Cover and let cook for 15 minutes. Some liquid should form in the base of the skillet to soften the onions and garlic. An occasional stir to evenly distribute the onion and garlic is a good idea but keep the lid-lifting to a minimum. Turn chicken pieces to the other side. Add the lemon slices, lemon juice, olives, raisins, and 2/3 cup of the defatted stock . Bring to a simmer on medium heat, then lower the heat to low, cover, and cook at a gentle simmer for an additional 30 – 35 minutes, until the chicken is cooked through and quite tender. You can add more stock if you think the dish is looking a little dry, but heat the extra stock before you add it quickly, and no more than a ¼ cup at a time. If you are highly averse to fat you have the option at this point of cooling the dish, refrigerating it and skimming any excess fat from the dish before reheating it. But there will be a little less flavour ! At the end of the cooking process, or when the dish has been reheated to simmer stage for five minutes, fold through the flat leaf parsley and turn off the heat. Adjust for extra salt and pepper to taste. Scatter fresh coriander over the dish before serving on a large serving plate. If you are in the mood for an extra garnish cut a lovely fresh lemon into wedges and arrange at the corners of the plate. An extra squeeze of lemon will not go amiss. Serve with couscous, plain steamed basmati rice, or for a special treat, with Libby’s lemon focaccia. Make Lemon curd: Whisk yolks, lemon rind, lemon juice and sugar in a heavy-based saucepan to combine. Cook over medium- high heat, stirring constantly with a wooden spoon (be sure to scrape the sides of the pan), for 8 to 10 minutes or until sugar has dissolved and mixture is thick enough to coat the back of the spoon (or registers 70°C on an instant-read thermometer). Remove saucepan from heat. Add salt and butter, one piece at a time, stirring until smooth. Strain through a fine sieve into a medium bowl. Cover with plastic wrap, pressing it directly onto the surface of the curd to prevent a skin from forming. Refrigerate until chilled and set, for at least 2 hours or up to 1 day. Make Seven-minute frosting: Combine sugar with 2/3 cup water and glucose syrup in a small saucepan. Clip a candy thermometer to side of pan. Bring to boil over medium heat, stirring occasionally, until sugar dissolves. Continue boiling, without stirring, until syrup reaches 110°C. Meanwhile, using an electric mixer, beat egg whites in a heatproof bowl on medium-high speed until soft peaks form. With motor running, add extra 2 tablespoons sugar, beating to combine. As soon as the sugar syrup reaches 110°C, remove from heat. With mixer on medium-low speed, pour syrup down side of bowl in a slow, steady stream. Raise speed to medium-high. Beat for about 7 minutes or until mixture is completely cool (test by touching the bottom of the bowl) and stiff (but not dry) peaks form. Use immediately. 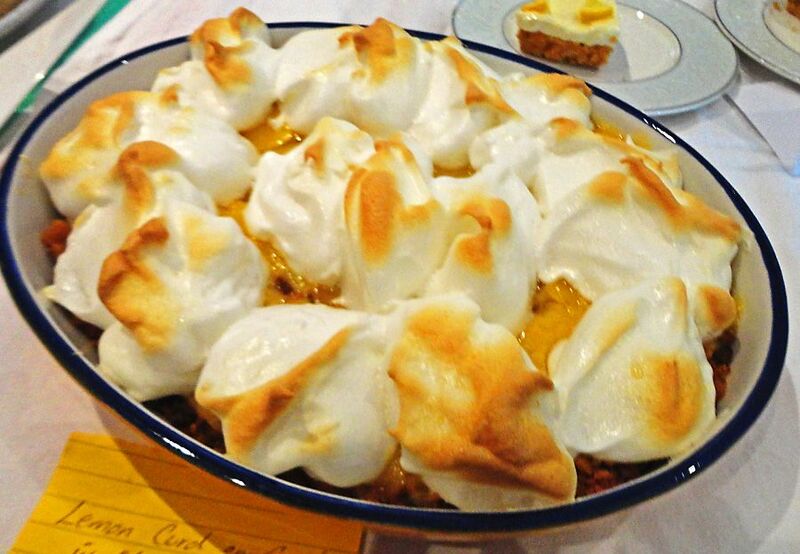 Place the crumbs into a dish, top with the lemon curd and top with the meringue. Place in the oven until the meringue browns.